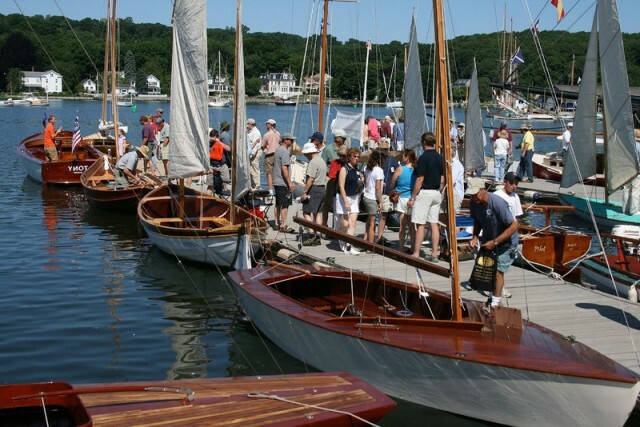 Brooklin, Maine — The 23rd annual WoodenBoat Show, presented by WoodenBoat magazine and hosted by Mystic Seaport June 27-29, 2014, will celebrate three of N. G. Herreshoff’s most beloved designs: the 12 ½, Newport 29, and Buzzards Bay 25. All three were originally conceived in 1914, and turn 100 this year. Attendees at the show will be able to view many examples of the three designs at the show. The participating boats will be grouped together at the north end of the Museum and on the New York Yacht Club dock. Herreshoff Manufacturing Co. built 360 of the popular 12 ½s between 1914 and 1943, and builders have continued to produce the design up to the present day. Originally designed for children, the 12 ½ has proved a coveted design due to its roomy cockpit, ease of handling, and capable performance. Several yacht clubs still race the “H Class,” and many families use them for casual daysailing. The Newport 29, by comparison, is a rare design. Herreshoff Manufacturing Co. originally built only three of them in 1914: Comet, Dolphin, and Mischief, and a fourth, Teaser, in 1926. Dolphin and Mischief still actively sail in the Newport area, and are slated to be at the show. Ballentine’s Boat Shop recently restored Teaser, and will display the boat as an example of their craftsmanship. Also in attendance will be Rogue, the 1950s iteration of the design, built by Seth Persson, and boatbuilder Brion Rieff will bring his 2008 cold-molded version, Iolanthe. The Buzzards Bay 25 is one of the largest daysailers of the classic boat world, a keel centerboarder known for its powerful, exciting performance on the water. The original class had only five vessels, four of which are still extant: Mink, Bagatelle, Whitecap, and Vitessa. Whitecap, now Aria, another MP&G restoration, can be viewed at the Herreshoff Marine Museum. Bagatelle‘s owners have indicated their boat will be at the show, and Giblin stated MP&G will bring Mink, the first boat of the class. Mink is currently undergoing a major restoration at the MP&G shop. Skills demonstrations will be hosted daily at the Museum’s Henry B. duPont Preservation Shipyard. This year’s theme is “tools of the trade” and the skills demonstrations on each of the three days will include “something old, something new.” All of the presenters are professional boatbuilders and there will be five demonstrations daily: 10 a.m., 11:30 a.m., 1 p.m., 2:30 p.m., and 4 p.m. (There will be no 4 p.m. presentation on Sunday, June 29.) The demonstrations will focus on traditional boatbuilding methods in the morning and the latest techniques in the afternoon. F. Jay Smith will start off each day at 10 a.m. demonstrating tools used in traditional Scandinavian boatbuilding. Jay, of Anacortes, Washington, served apprenticeships in Norway and the Faroe Islands to learn the building-by-eye techniques of those lands from master craftsmen. On Friday, he’ll show how specialized axes are used, and his Saturday demonstration focuses on planes, especially a two-man type favored in Scandinavian boatyards. On Sunday, he’ll talk about “Whetstones and Sharpening: Early Iron Age to Present,” recognizing that sharp tools are the foundation of good craftsmanship. A more modern tool of traditional boatbuilding will be shown by Roger Hambidge, a good hand with a shipwright’s adze, an essential tool in 19th-century New England shipyards. On Saturday, Mystic Seaport shipwright Walter Ansel will show how to put together an apparatus for steam-bending wood, and on Sunday how to use tools essential for drawing out a boat’s plans full-sized. Homemade tools for boatbuilding are a specialty of Harry Bryan, a New Brunswick boatbuilder, who will pass on his knowledge of metalworking and specific tools he has found most useful in his own inventive techniques. Tools used to drive cotton and oakum into planking seams will be demonstrated by Rob Whalen, the project leader on the recent restoration of the Charles W. Morgan. Each afternoon starting at 2:30 p.m., Mystic Seaport shipwright Scott Noseworthy will demonstrate how large-capacity shipyard tools handle large timbers of the kind used in ships like the Morgan. On Friday at 4 p.m., John Brooks, a designer and builder from Brooklin, Maine, will show why routers and jigs have become an essential part of the boatbuilding he favors, which uses light plywood and powerful epoxy glues. On Saturday, Brion Rieff, who also runs a Brooklin boatyard, will show how vacuum-bagging has transformed lamination, the layering of thin pieces of wood to achieve the curved shapes so crucial to boat structures. And David Snediker, owner of Taylor & Snediker Woodworking in Pawcatuck, Connecticut, will show the efficient use of his favorite hand-held power tools for boatbuilding on Sunday at 1 p.m.
Posted in News on June 19, 2014. Museum admission, which can be purchased online or at the main entrance, provides access to both the WoodenBoat Show and Mystic Seaport. Admission is good for two days upon ticket validation. Museum members are admitted for free. Three-day passes are available for purchase online until noon on June 23 on the WoodenBoat Show website. Passes are $36 for adults and $22 for children. Additionally, more than 100 vendors will offer items for sale including maritime art, antiques, tools, books, nautical gear, and much more. Those interested in the construction of smaller boats can stop by the Family BoatBuilding tent, where families and teams will work to build their own canoe or skiff during the weekend. Other events include the return of “I Built it Myself,” a display of home-built boats; a Concours d’Elegance; and skua races.